Today we reached our target, which has been unfolding over the past year and it’s not something I planned to do until we had actually got to the end of January. By then we had rung 4 quarter peals and tested the water to see whether there was the enthusiasm to ramp this up and be on this journey for the long haul! By the end of February we started to see that this was a possibility by ringing 8 in that month alone and increasing our average required throughout the year. March was an interesting month as we were able to ring another 8 quarters and were able to rope in Richard Laing for the majority of these, due to his house sale being delayed and therefore delaying his move back to Oz. Richard was nicknamed Mr 2 Weeks as for 8 weeks he thought he kept on extending his stay by a 2 weeks each time. So by the time we had got to Easter we were just over a third of the way to our target and could take a little breather by just ringing 5 in April. We even packed in our weekend away and revisited our friends in Street for another famous reunion and a fine ring on the 8 in a North Wootton garage. In May we rang a further 5 with the most notable one being an all single touch of Plain Bob Major to celebrate Ossie Roberts 99th birthday, our oldest honorary member. That also took us to the half way stage but no time to rest up! We started June with our fundraising charity lunch, where we cooked up a £400 profit for a local children’s charity and then got seriously into some Diamond Jubilee ringing. We scored a further 8 in that month and I felt we were cruising with plenty of fuel in the tank. We even had time to go and ring a few away from home and especially enjoyed ringing on the ‘down the river Welland’ challenge at Maxey. As we hit July we were edging on getting close to 40 quarter peals but now it was time for me to go back and earn a crust. This time Dorking bound and whilst the band has been working hard back in Peterborough I’ve been enjoying the delights of ringing on the ten both at Dorking and Leatherhead. Needless to say they’ve done pretty well without me and under Stuart Weston’s leadership clocked up another 8 in July, one of which was Alex Dyer’s 100th and doubling his tally in less than a year. With the holiday season upon us August was the quietest month so far with just 3 being scored but that did allow time to support the clock appeal events going on at St Mary’s and time to visit the biggest beer festival outside London. At the start of September we had reached our 50th and now had to take our foot off the pedal as we would have peaked too early and so just rang a further one in September. June Pitcher also achieved her 200th quarter in September. October started on a high with some friends coming over the Lincolnshire border to help make up a band of Cambridge Surprise Major. With just another 2 more rung in October we were slowly edging to the finishing line. One notable achievement was Tom Stevenson’s first quarter covering and he’s gone onto to treble to another one since. November was a month to consolidate and keep things on track. It was also an opportunity to rope in a few more ringers and try something new with a quarter of St Andrew’s Place Doubles to conclude the month on St Andrew’s Day. At the start of December we had just two to go and the only pressure has been on this evening’s quarter, as otherwise we wouldn’t have been able to retire early and celebrate! So in conclusion to this epic year we set out to ring for Queen and Country but our Queen isn’t the only one celebrating their Diamond Jubilee as Geoff Davis has been ringing at St Mary’s both man and boy and it’s fitting to use this occasion to celebrate his 60 years of service to St Mary’s. He’s also been our leading quarter peal ringer and we’ve worked him hard! Importantly we couldn’t have done it without YOU, as 34 ringers have been involved and we’re grateful for your dedication and support. Who knows what lies ahead for 2013? A few less no doubt but get ready to be challenged!!! Finally I would like to present two awards this evening. 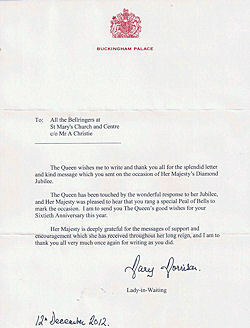 First to our own Diamond Jubilee man, who has rung in most of these quarters and should score his 60th this year. Secondly to Stuart who proficiently took up the baton to conduct many in the latter half of this year. NB. Sadly Geoff couldn’t be there last night as he was hospitalised with a dislocated thumb. 60th quarter on the bells in 2012 and rung to conclude our Diamond Jubilee Challenge. Also rung in recognition of Geoff Davis' 60 years ringing at St Mary's and get well wishes from all his friends. If you live locally you may well have heard us ringing before services on Sunday mornings or practising on Thursday evenings. We hope this web site will make you curious. Please visit us and perhaps try your hand at our ancient and fascinating art, you will be assured of a warm welcome. If you are a ringer elsewhere we invite you to visit us and look forward to meeting you. St Mary's has a ring of eight bells (tenor 8-3-17 cwt). Practice night is Thursday between 7.30 and 9:00pm. We ring every Sunday morning between 9:15 and 10:00 and regularly attempt quarter peals at 5:30pm on Sundays.